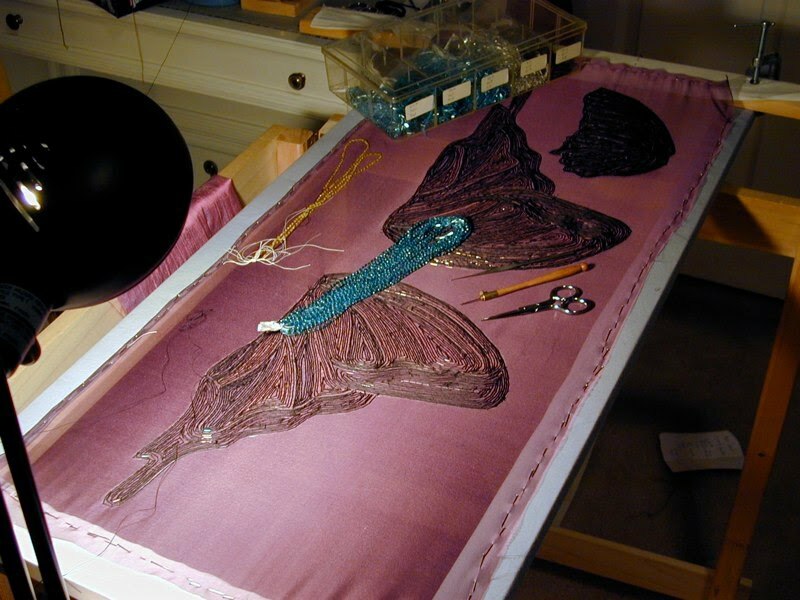 One of my absolute favorite blog posts of all time on my own blog was this one...and it's because it speaks to my lifetime hope and dream of traveling to Paris to study at the L'Ecole Lesage to learn haute couture embroidery techniques. 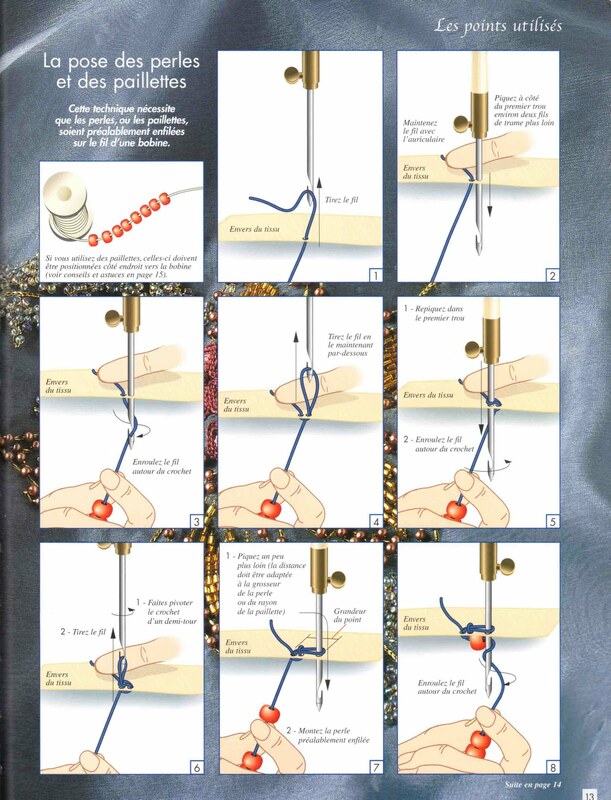 Many of these techniques involve a certain type of embroidery using a tambour hook...often referred to as Broderie de Luneville and worked with the back of the embroidery facing up and the beads/sequins being threaded from underneath. So, while I wait to gather the time and resources for my dream trip, I have been on the hunt to find a tambour work teacher here in the States, contacting Lacis and following down many leads to no avail. That's until my beading friend, Dot aka SpeedieBeadie, wrote on a list that she was attending a Tambour Beading Masterclass in June. What? Who? Where? Dot led me to Robert Haven who is a costume technologist, Associate Professor of Costume Technology at the University of Kentucky. 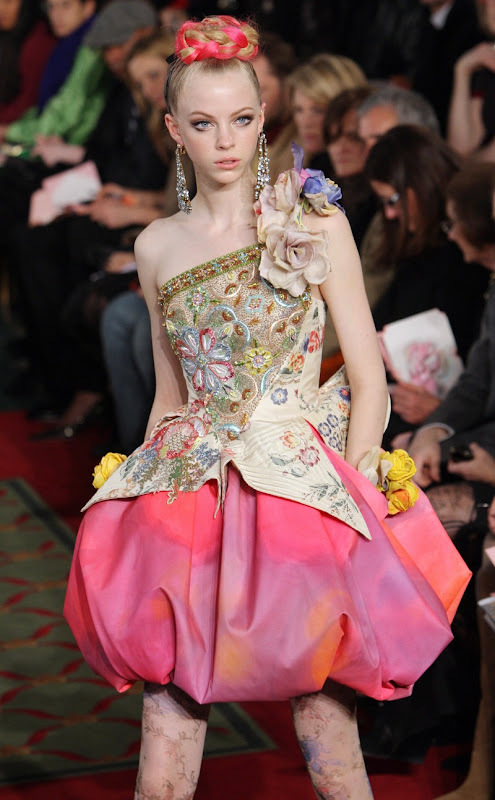 Last year, Mr. Haven went on sabbatical to complete the Professional course in Haute Couture embroidery at Lesage. 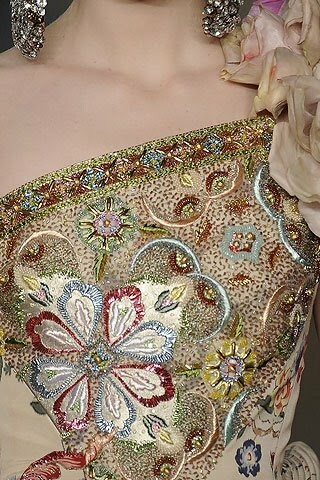 Here is his completed work using all of the techniques used by the atelier to embellish the garments for the runway. With 150 hours of class time and 300+ hours of personal stitching time. And, if that isn't enough...Mr. Haven has also studied Japanese embroidery and his University will be hosting the 2011 Japanese Embroidery World Exhibition...He will also be the first site to incorporate a Japanese Embroidery class into an academic curriculum with a class to begin in May 2011. Phew! I cannot wait to meet this man! And, luckily, he wrote last week that someone had unexpectedly canceled from his Beading Masterclass this June and would I be interested??? And how! I jumped, made my reservations and I am on my way...I'll be leaving on Tuesday, June 8, 2010 to attend his class. I'm hyperventilating just writing about it...And yes, I'll tell you all about it! The classes for this year are full but Mr. Haven is keeping a list for next Summer's courses. Last he wrote, there were already 12 people signed up for 2011...And there may be an opportunity for a Fall class in New Orleans. Another wonderful blog post, Susan. Your enthusiasm is catching. I hope you have a great time in June - and tell us all about it! Oh how exciting and you're going on my birthday which has to be some kind of magic day anyway... It so great to have lifetime goals and even greater to live them.. I can feel your excitement from here - I am sure you will have a wonderful time - can't wait to see what you come up with. That trip to the RSN with me and CA is getting closer I can feel it. Your enthusiasm for this is so obvious that I can see your eyes shining from here. And I am soooo envious that I am a shade of green to rival the new leafs bursting in the hedgerows today. But I am excited because I know that you will share your experience with us. Is it June yets? And OMG the bodice on that dress. Wow, wow, wow. Wow... What a wonderful experience this will be. I went out to the website and saw the samples from other courses. I look forward to seeing your work when you return. Wow, what a wonderful experience you are going to have. I know you'll enjoy it immensely and we will all look forward to hearing about it when you get back. Inspiring work! I can't imagine anyone more appropriate to fill that empty spot in the class than you! As always, your enthusiasm is infectious and I can't wait to see what you come up with as a result of this class! It's sure to be stunning! I started to read your post and I thought...tell her how to get a hold of Dot...then you said her name!! This is such a fantastic opportunity for you. Proof positive that all you have to do is tell the Universe you want it and it comes to you! I am sooo very excited for you!!! Where will the classes take place??? You just can't beat the networking opportunities that the internet provides for us!!!! 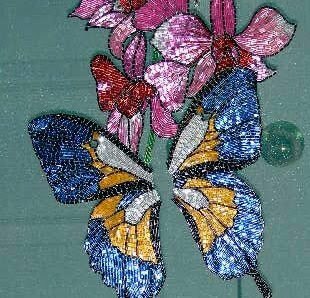 I must say taht I ahve a ahard enough time making decisions and beading the way I want with the beaded side facing me- not sure that I could handle the pressure of this technique!!!! !I know that you are definately up for the challenge!!! Big Haqppy Hugs! What wonderfull news... and this chance is not the sligthest wasted on you. You of all people deserve it! OMG still 2 more months to go... anticipating your posts and wonderfull photography makes me want it to be june already! And there you are telling me I am already flying. You must be on wings right now! Still I hope you will go to Paris one day to fullfill your dreams and to meet me. I will come over to Paris if I need to, to shake hands. 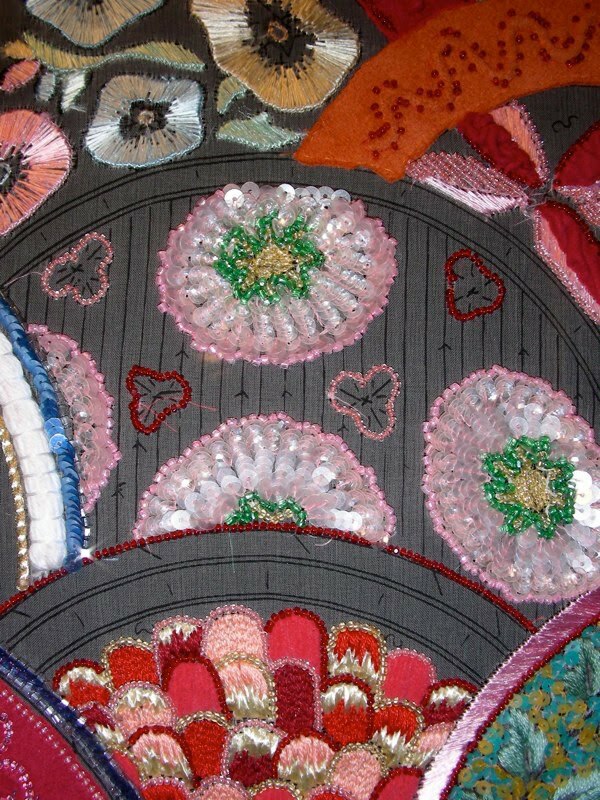 What a fantastic opportunity - and omg, that embroidery work is exquisite - I know for sure you will soak up the skill and knowledge being shared and it will enrich your pieces further. Though you already know that I think your work is breathtaking. Susan, I can't wait either. 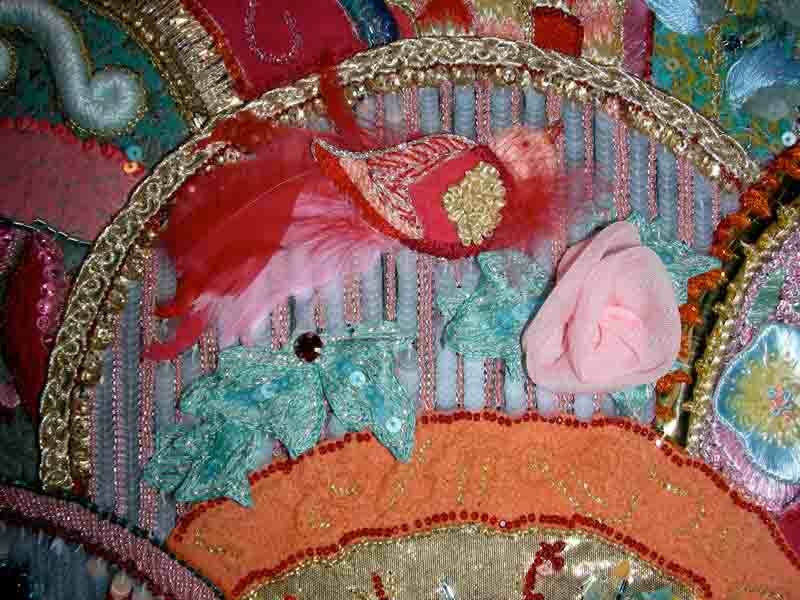 I first found his website through a beading pal, Dulcey Heller. So you'll have to just thank her for finding him. Too bad we aren't going to be in the same class...boohoo...but I think we are going to get a handle on this new way to bead that is going to be outstanding. Amazing work! I can't wait to see what you come up with from this class...whatever it is, I'm sure it will be gorgeous! Wow -- that is some beeeeeautiful handwork. 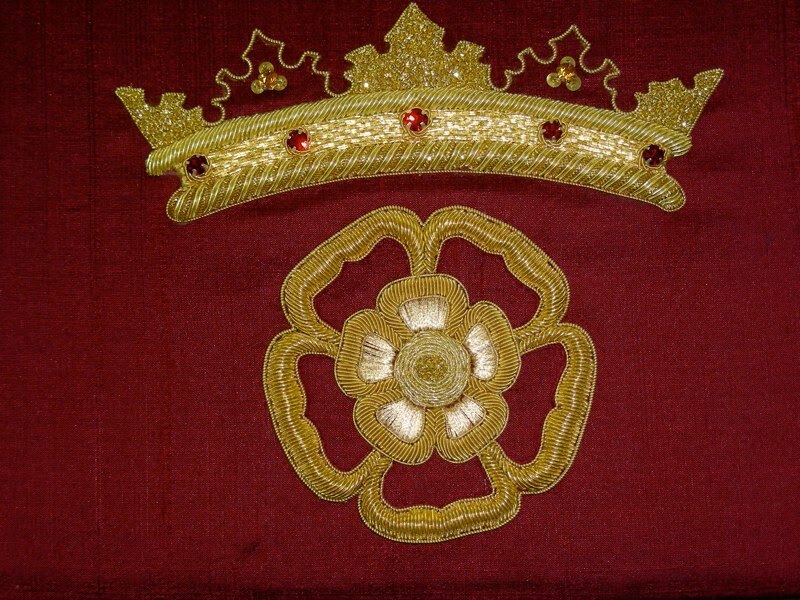 I love the goldwork as well. As usual, I can't wait to see what you learn in your class. UK in June ought to be a lot of fun as well. I've thought about buying that Luneville embroidery book that's in French - just coz it's so ME - sparkly and intense. Pity I have no French! Oh Susan, I am Soooo happy for you! What a wonderful opportunity, and you are the perfect person for that one open spot. I can't wait to hear all about it and see what wonderful things you create in the class... We (your readers) are all just as excited for June as you are!! Anticipation is a wonderful thing, is it not? And that bodice ...oh my!!! How wonderful for you!!! I can't wait to see what you do! Wow! Congratulations! Lucky, lucky you! I have often thought that marathon runners were a breed apart. Is it their capacity for perseverance? Is it the discipline to run those races "one-telephone-pole-at-a-time," not thinking about the end of the race as much as just making it to the next marker...and then the next...? Is it the ability to intensely focus over long periods of time yet at the same time be able to relax, breathe, have FUN with the challenge ahead? 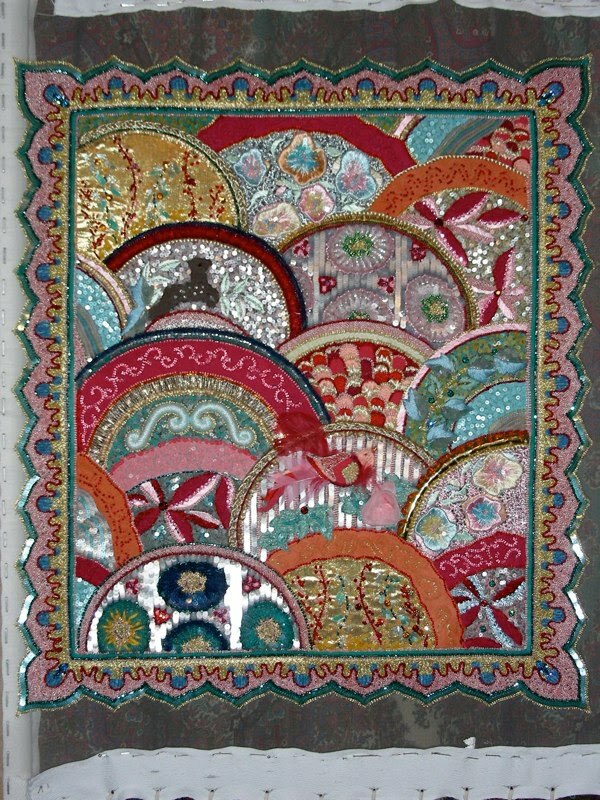 Beautiful stitchery is a great feat...a long, long road of markers - personal marks. I cannot tell you how much joy it brings me to know that you & your needles are RUUUNNNNIING!!!! Once upon a time I got a spot in a class due to a cancellation. As a result, I learned to use my newly purchased Bernina under Valerie Campbell-Harding's watchful eye on her one-and-only teaching trip to the United States. It was an amazing experience and set my direction for free motion embroidery off in the direction best suited for me. I hope that your experience is as significant because your enthusiasm has all the promise to make it a most wonderful, life-changing one. PS We corresponded about a Decision Portrait. Are you and your family still interested? Please let me know. I'd be honored to include this piece in my upcoming solo show at the City Gallery at Waterfront Park in Charleston this fall. This is soooo exciting - I've always wanted to study at LeSage also! Thanks for sharing! Awesome! 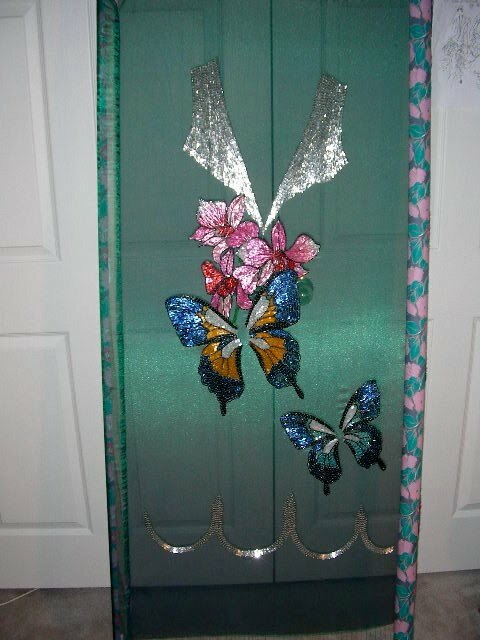 I'm not a serious enough needlewoman even to take a class, but I would love to know where to get one of those hooks so that I can add the occasional embellishment to some of my projects. I look forward to seeing what you learn in the class and what you do with your new knowledge. How wonderful Susan, I can't wait to see what you do with the new techniques you learn ! Incidentally, did you know tambour embroidery also exists in India (Ari and Zardosi) ? I just have to say, I love how the internet works! Have a fabulous class with Bob! It sounds just wonderful. I can see right now that if Susan doesn't have a great time at the Masterclass and doesn't come back with some fabulous techniques I will be answering to the lot of you! ...No pressure though I am sure;) I will do my very best to make sure she gets the techniques and shares them with all! Off to the RSN for May then let the fun begin!